In the same vein of Loving Frank, Clara and Mr. Tiffany, and The Paris Wife comes this novel; a fictionalized account of the actual life of Anne Morrow Lindbergh; wife of the famous aviator Charles Lindbergh and author of Gift of the Sea. All of these books tell the story of women who are paired in one way or another with incredibly strong and difficult men. These brave women spend their lives trying to appease or compensate for their brilliant but deeply flawed partners and this book paints a painful picture of that lonely life. One of the things that really stood out to me is how horrifying it is to lead a life in the spotlight. There is no anonymity. Every time a celebrity goes to a movie or the grocery store they take the chance that they will be mobbed by the paparazzi. It was the same for the Lindberghs, America’s first couple of the air. They were surrounded by fans whenever they were and that attention is both exhausting. I loved learning more about Anne’s life. Her book Gift of the Sea meant a lot to me, but I didn’t realize that she also got a pilot’s license and took solo flights. She withstood so much pressure and grief throughout her life, but somehow she found pieces of happiness and peace to hang on to. BOTTOM LINE: Heartbreaking, but hard to put down. It was difficult to watch Anne sit back and let her husband run her life, but I also admired her quiet strength. "I had been a passenger in our life together for far too long." 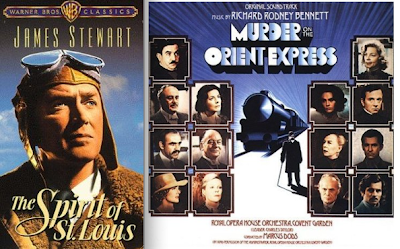 Pair with a viewing of The Spirit of St. Louis and Murder on the Orient Express. Both have ties to the Lindberghs, but in very different ways. I on the waiting list for this one on audio at the library! At first I wasn't really drawn to read it, but so many of you have had such a positive response, I caved. Sandy - I think you like it, because you liked some of the others that are in the same vein. It's not that the story is so perfect, it's just fascinating to read about what she went through. She was incredibly brave. I had a hard time with this book :( Mostly because both Charles and Anne came off as such dips, lol. I think it was just me though, I've read many more positive reviews than negative. Jennifer - I agree that neither was a loveable character, especially Charles (ugh!). But it still worked for me, because Anne was flawed, but strong in a unique way. A friend recommended Gift from the Sea many years ago and I have loved it ever since. It is one of the few books I have read several times. So I have put this new book on my TBR list as it sounds interesting. There are small hints in Gift from the Sea that things are not always what they seem in a marriage. "The something, something wife" but I REALLY want to read this one! SarahJ - That's the main reason I wanted to read this one. I really loved Gift from the Sea and I was curious about its author. Bybee - Yes, I agree. They always make me wary, but if I'm curious about the woman herself I will read it.